Hello Everyone! The embroidery on Jacobean Bunny is finished. I haven't taken a photo yet but will soon. I am thinking about doing a tutorial and drafting out the pattern for anyone interested IF it comes out ok. My first stuffed animal so not sure what the results will be. I am quite happy with the embroidery part though. 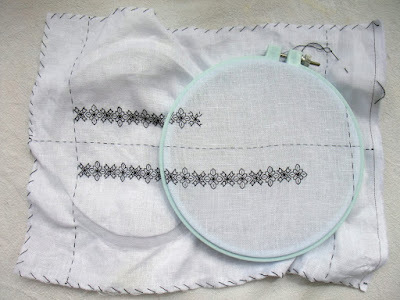 In the meantime I have started on my blackwork. I just couldn't wait. Since the studio is a mess with packing I had an excuse. I cant even get to my sewing machine right now! I haven't done black work in years so I decided to start with a practice piece, but one that could be useful anyway. I picked out a set of cuffs and collar from Janet Arnold's Patterns of Fashion View 12 the 1580-1600 Men's Shirt. I realize that the entire piece is embroidered but to start out I thought I would stick with something small and simple. I chose a few geometric fill patterns and combined them to make a band pattern. I think they go well together and I am already zipping along with it. I laid out the two cuffs on one piece of linen with plenty of seam allowance around them. The linen I am using is not perfectly even count. I prefer this and my reasoning is this. I highly doubt that weaving methods in the 16th century were exact enough to produce perfect even weave linen. this linen is barely off but just enough that I feel good about it, if that makes sense. I can't remember the exact thread count but I believe it is 52x54 per inch. 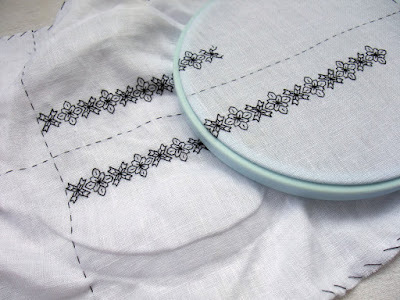 I did my stitches over four threads. this seemed to be a nice choice making the motifs small but not TOO delicate. I already have ideas bouncing around for designing a coif based on the blackwork in this painting http://en.wikipedia.org/wiki/File:Elizabeth_I_Jesus_College_Oxford_1590.jpg I just love the free flowing flowery vines and the blackwork fill is just exquisite! Beautiful designs. 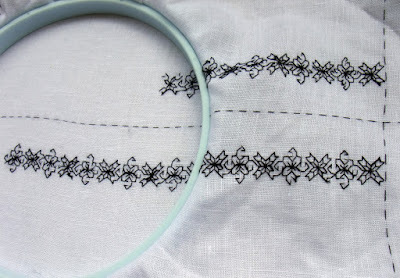 I've always loved Blackwork, and found it restful to stitch too. You're having fun aren't you!